Sterling Silver Channel Set Princess Cut CZ Engagement Ring and Wedding Band Cubic Zirconia Ring. This Stunning Sterling Silver CZ Ring Features a princess cut 0.75 or 3/4 carat center stone with Channel Set CZ Princes cut side stones. 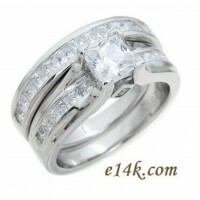 The matching band also has several channel set Princess cut Cz Stones. For a total carat weight of 2.50 carats! Beautiful Engagement ring and matching wedding band! Beautiful, Hand-Crafted, top quality Jewelry workmanship!!!. Nice heavy ring and shank.